What’s The Best Online Helpdesk Software: Zendesk.com or Freshdesk.com? If you have been looking for helpdesk software solutions online, no doubt you noticed two very popular solutions Freshdesk and Zendesk that are currently one of the leaders in the help desk market. Both solutions offer quality features, cloud-based customer support and ticket management at affordable pricing and with a low learning curve. What are the key differences between these two solutions? Beyond getting recommendations from your colleagues, how do you actually decide which software program will fit your company needs? To help guide you in your buying process, this article compares Zendesk vs Freshdesk and reviews the two helpdesk platforms according to communication channels, ticket management, self-service, and reporting features. While Zendesk is certainly a very good solution our team of experts found Freshdesk to be a better service of the two. Our B2B team reviewed all major help desk solutions on the market (including Zendesk) and Freshdesk received the highest score in that research. Freshdesk also has a great free trial plan that allows you to check out the features and benefits of their tool. If you want to test this app on your own you can easily get Freshdesk free trial here. Freshdesk was founded as a trailblazer in the customer support sector in 2010. Its product was officially launched in 2011. Although the solution has yet to go public, Freshdesk claims a huge customer base of 50,000. Prominent Freshdesk customers include Cisco, 3M, Sony Pictures, and Honda. You can get more information about Freshdesk’s features, pricing and integration options in our Freshdesk reviews. Our B2B review team evaluated Zendesk and gave it a place in our top help desk software ranking. 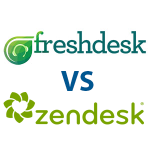 Compared with Freshdesk, Zendesk is the older tool by about four years. Created in 2007, Zendesk now has at least 60,000 customers and boasts an estimated revenue of $127 million. Notable Zendesk customers include Box.com, Shopify, Trivago, and the Federal Communications Commission. You can get more information about pricing, features and integrations of this service in our detailed review of Zendesk. 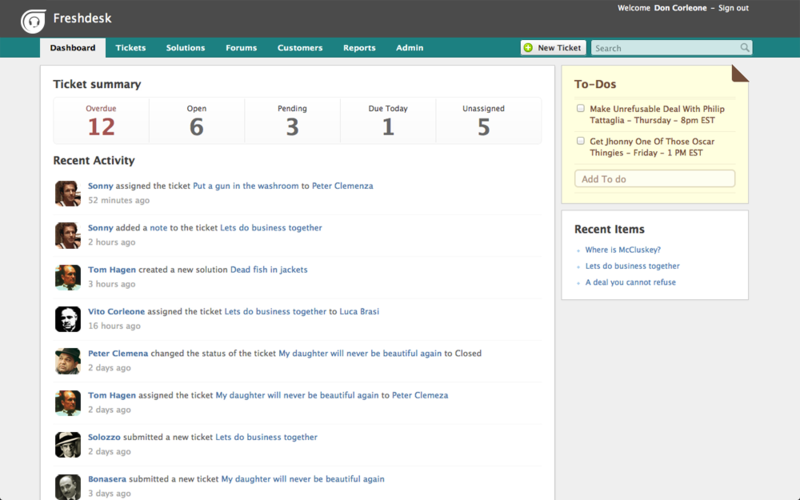 Ticket management is generally the backbone of any helpdesk support. Thus it is crucial that the software solution you choose provides sensible workflows as well as the right and quick automation in the right places. The ticketing system of Freshdesk is built around a shared company inbox that handles incoming requests and provides your helpdesk agents with the capacity to see ticket status as well as who is working on what. Your helpdesk team members can provide additional notes, opt-in to get notifications, or even tag requests with customized labels. Each of your tickets would show customer information, a status and due date, notes, ticket properties, and a rich text editor to send easy replies. Helpdesk agents can also use canned responses to quickly send pre-formatted replies to some of the common customer questions, and merge client tickets that report a similar issue. Administrators can also set custom SLA (or service level agreement) policies to prioritize tickets and, with the help of built-in time tracking, create resolution windows. Freshdesk’s upper-hand here compared with Zendesk is its helpdesk gamification system, Freshdesk Arcade, that can help your helpdesk agents stay productive and actively engaged through a rewards system. Your administrators can establish the game feature to reward badges or points for completing resolution tickets, or for completing customized “quests” (for instance— answering 10 forum posts in a week). Zendesk’s ticket management, compared with Freshdesk, is more embedded into the different channels where customer requests are made. For instance, through the email support, users or customers can submit tickets by writing a message to an email address, which is something like support@yourcompany.zendesk.com. This user action can immediately create a ticket and sets up a communication exchange between a helpdesk agent and customer until resolution of such concern. In terms of features, Zendesk is quite similar to Freshdesk, providing you with automation rules, triggers, collision detection (which can keep helpdesk agents from simultaneously working on the same ticket), custom SLAs, and pre-defined responses (which the tool calls “macros”). Automated ticket sharing is one of Zendesk’s unique features, letting you to automatically share customer tickets between various Zendesk accounts. This feature can be especially beneficial if your products integrate well with other companies that use Zendesk. Each helpdesk solution offers a good swath of channels enabling customers to submit requests and tickets. Freshdesk can cover phone support, live chat, email, and social media, depending on the product edition. The built-in phone channel in the tool will give your team complete access to a cloud-based call center environment, which includes an interactive voice response (IVR) system, mobile device integration, transfers, and call-to-ticket conversion. In addition, customers can reach your agents using a live chat module available on your website, Facebook, Twitter, a customer feedback widget, and a self-service portal. The self-service portal is customizable and fully integrated with your website’s knowledge base and forums. Thus, your customers do not have to log in several times to more than one system to look for answers. Once you have set up your knowledge base, the tool can use the entries in the said platform to suggest possible solutions to your customers while at the same time you are working on a ticket. Zendesk’s support channels include their online Help Center, email, Twitter, Facebook, embeddable web widgets, phone, and instant chat. The tool’s chat support is provided through Zopim, acquired last year by Zendesk. However, Zendesk does not include this tool as an out-of-the-box feature. You need to get Zopim from the Zendesk app marketplace. Unfortunately, this means you company may have to pay extra, even though this feature may prove to be helpful. Zendesk’s phone service feature is provided by Twilio. It billed by the minute, which depends on whether the phone call is inbound or outbound. The pricing is similar to its rival Freshdesk. Zendesk Voice allows you to take and make support calls with the help of your existing hardware. It also gives you a good suite of call center features, such as call transcription, business hours management, and forwarding. In addition, it integrates with leading VoIP services including Avaya, 8×8, and Five9. You may not quickly associate data analytics with helpdesk support. However, as almost any business department in today’s environment, reporting plays a big role. Data analytics gives managers much-needed insight about common ticket types, product strengths and weaknesses, where helpdesk agents are failing and succeeding, peak complaint times, customer satisfaction, and a good number of other metrics. Zendesk has a powerful reporting module that can analyze data on agent performance, channels, tickets, and customer satisfaction. Many of these reports are generally dynamic, which means you can use filters as well as responsive dashboards to analyze and manipulate data and create new discoveries. The Zendesk Benchmark module allows you to compare your helpdesk team and your clients to your industry and global benchmarks. Zendesk also has survey tools (such as SurveyMonkey integration) for analyzing customer satisfaction as well as Net Promoter Score. Freshdesk also has a good range of reporting functionalities. “At a glance” reports allow you an easy view of crucial metrics such as SLA violations or response time. Summary Reports at the same time dive deep into every customer ticket handled by your helpdesk agent during a specific set time period. Your managers can also compare agent performance or customer satisfaction against key performance indicator goals. You can also see a list of the top agent performers according to channel type. In addition, Freshdesk has its own built-in satisfaction surveys that can collect feedback immediately from resolved tickets. With Freshdesk, your company can make sure your customers are getting quality service and that helpdesk agents in your company can resolve issues quickly and effectively. Of course, these helpful metrics can connect to Freshdesk Arcade, so helpdesk agents get incentivized to earn very high satisfaction scores. Which Help Desk Solution Is Better? As you can see, the dilemma between Zendesk vs Freshdesk is quite hard. Both platforms offer very similar strengths. They are full-featured, easy to use, affordable, and equipped with round-the-clock client support teams. Zendesk has unique features, such as the Zendesk Benchmark tool, which allows you to review your helpdesk team’s performance with over 25,000 global companies. Freshdesk’s gamification theme, on the other hand, is a unique enhancement to the usual helpdesk ticketing. However, the devil is in the details. After a thorough analysis of features, pricing plans, level of customer support, and available integrations, our experts found Freshdesk to be a slightly better option. Freshdesk is our suggested help desk for all companies that require a reliable and efficient solution. You can also easily test its features with their great free trial offer. Users can sign up for Freshdesk free trial here. What Is The Purpose of Help Desk In A Business?